The ever emerging industry at the global level is the food industry. With the developing innovation, the reliance of individuals on eateries is expanding at a quick rate. The restaurants using trending technologies are able to attract more potential customers than those who are not. Thus it is no more a choice to introduce your restaurant business in the digital world, it has become a necessity. For this, it is important to incorporate your business into web-based software. But do you think it is enough to grab the attention of potential customers? No, it's not, you have to work on innovative ideas and explore the latest tools that make your restaurant stand ahead of your competitors. Since after entering your restaurant the next thing that customer come across is the menu. Therefore it is important to look for the ways to make it better. You can do this by getting a digital menu in your restaurant. But make sure that the list is capable enough to grab customer’s attention. An attractive and well-designed menu list within your software not only help in delivering the right and complete information of your product but also increase your brand credibility and enhances your visual identity. A well-defined structure, colors, and other design elements help you in optimizing your menu and present better readability of the list. Here are some of the best features that you should look for while designing a digital menu list for your restaurant. Pay attention towards its structure: A systematic arrangement of the content helps the customer to understand the menu better and also help them in making the right decision. For example, categorizing all kind of bread together will aid them in understanding all the offerings and in knowing the difference in the price of various available options. 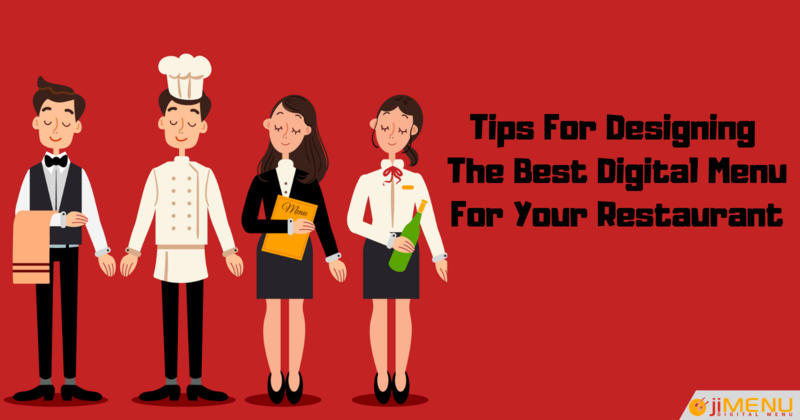 Make it appealing and attractive: There is no uncertainty that an appealing and influencing menu list attracts more customer and also once the customer has a glance on the list there is hardly any chance that he return without making any order. You can do so by using animated content. A good and quality animated description of the items influences more customers. But make sure that your menu list is not overloaded with useless animation or a large number of animation content. Also, you can make it more appealing by using the right contrast and color combination. Using bright colors make it hard for the users to read thus resulting in failure of your efforts. Easy updating of menu list: If you want to add or remove any item or ingredient from your menu lists or want to update your current list then make sure that you are able to do so without any technical support. Good digital menu design is the one that offers easy and seamless addition and removal of the items on your menu boards. Display nutrient information: Nowadays, people are more concerned about their health and therefore they like to analyze the nutrients they are taking in through their food. Therefore it is essential to ensure that your digital menu board can do so. Most of the digital menu boards have icons corresponding to every type of dish (like hearty man special etc), this helps people in considering the health benefits of the food they are choosing. This also increases your credibility thus accelerates your business growth. Able to convey your brand image: A menu board should have the right symbolization of text, color scheme, and theme. Also, it is important to pick the right element from your website, logo etc to make your menu design visually appealing. So it is the time to streamline your user experience by creating a customizable digital menu board. You can look for different options of displaying the menu on the digital channel. If you haven’t found any reliable and unique digital menu solution for your restaurant or hotel then rely on jiMenu POS. We work indigenously for adding features to your digital menu board that helps you to check self-orders, vacant tables, making orders and also in calculating total sale in the graphical form.